Half price offer valid from tomorrow 04/04. Looking at this is making me hungry. I would imagine this pudding is best served with a good dollop of custard. 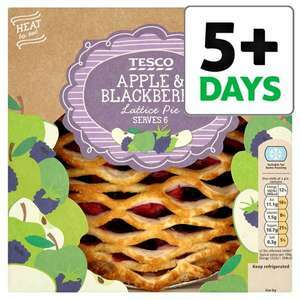 Shortcrust pastry with a Bramley apple and blackberry filling, topped with a puff pastry lattice, sprinkled with demerara sugar. Shortcrust pastry filled with Bramley apples and blackberries, topped with a sugared light puff pastry.